I have added electronic lift systems to the Aventos single fronted Hi Lift Doors. Touch to open and press the small black switch to close, effortless! The matt opal fusion glass splashback is painted to match the wall colour to blurr the lines. 8. Ouch-free overhead cupboards Electronically operated cupboards glide open and shut at the touch of a button. Lever arms open the door in an out-and-up motion, allowing clear access to the entire contents of the cupboard. This system also keeps the space in front of the cupboards clear, so you can keep them open during prep and move about freely without having to dodge intrusive doors. The open-close operation button can be discreetly installed at the base of the cabinet. Doors that open at a push of a button. Ouch-free overhead cupboards Electronically operated cupboards glide open and shut at the touch of a button. Lever arms open the door in an out-and-up motion, allowing clear access to the entire contents of the cupboard. 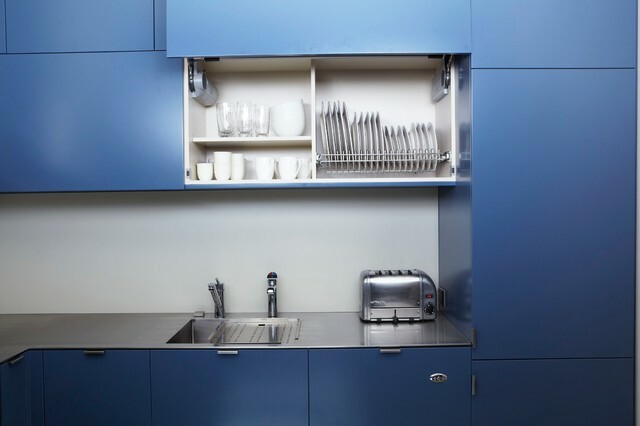 This system also keeps the space in front of the cupboards clear, so you can keep them open during prep and move about freely without having to dodge intrusive doors. The open-close operation button can be discreetly installed at the base of the cabinet.